[147 Pages Report] The aerospace 3D printing market is projected to grow from USD 714.5 Million in 2017 to USD 3,057.9 Million by 2022, at a CAGR of 27.42% during the forecast period, 2017 to 2022. The base year considered for this study on this market is 2016 and the forecast period is from 2017 to 2022. The report analyzes this market on the basis of vertical (printers and materials) and industry (aircraft, unmanned aerial vehicles, spacecraft). It studies the aerospace 3D printing market in North America, Europe, Asia-Pacific, and Rest of the World (RoW). The report provides in-depth insights regarding the aerospace 3D printing market. It also provides detailed information about the major factors, such as drivers, restraints, opportunities, and challenges influencing the growth of this market, along with an analysis of micromarkets with respect to individual growth trends, growth prospects, and their contribution to these market. The report also covers competitive developments, such as long-term contracts, new product launches and developments, and research & development activities being carried out various leading players in this market. It also provides information regarding various business and corporate strategies adopted by key players to strengthen their position in this market. Estimation of the market sizes of various segments and subsegments of the aerospace 3D printing market has been carried out through secondary research sources, such as Hoovers, Bloomberg Businessweek, Factiva, annual reports, and publications, among others and corroboration by primaries. The market triangulation has been done with the help of statistical techniques using econometric tools. All percentage shares, splits, and breakdowns have been determined using secondary sources and verified through primary sources. All possible parameters that affect the market have been accounted for, viewed in extensive detail, verified through primary research, and analyzed to acquire the final quantitative and qualitative data. This data is consolidated with detailed inputs and analysis from MarketsandMarkets and presented in this report. 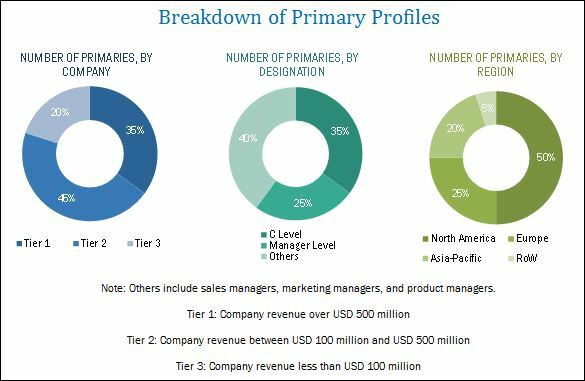 The aerospace 3D printing market ecosystem comprises manufacturers, such as Stratasys Ltd. (U.S.), 3D Systems Corporation (U.S.), The ExOne Company (U.S.), EOS GmbH (Germany), Arcam AB (Sweden), Ultimaker B.V. (Netherlands), Höganäs AB (Sweden), and Materialise NV (Belgium), among others. These companies not only provide raw materials and printers for 3D printing of components but also manufacture components for the aerospace industry. The end users of the aerospace 3D printing technology include aircraft manufacturers, such as Airbus B.V. (France) and Boeing (U.S.), among others and component manufacturers such as Rolls-Royce (U.K.), Pratt & Whitney (U.S.), and GE Aviation (U.S.), among others. The aerospace 3D printing market is projected to grow from USD 714.5 Million in 2017 to USD 3,057.9 Million by 2022, at a CAGR of 27.42% during the forecast period, 2017 to 2022. The growth of the aerospace 3D printing market across the globe can be attributed to increasing fleet size of various airlines and growing demand for lightweight aircraft components and parts. Manufacturers of aircraft and aircraft components are resorting to 3D printing technology to manufacture aircraft components and parts as this technology decreases the production time and shortens supply chain of the aircraft manufacturing. This market has been segmented on the basis of vertical, industry, and region. Based on vertical, these market has been segmented into printers and materials. The materials segment of the aerospace 3D printing market is projected to grow at the highest CAGR during the forecast period. The growth of this segment can be attributed to increasing use of different types of materials to 3D print different types of engine components. Development of new materials to be used for 3D printing of components and parts used in the aerospace industry is also expected to drive the growth of this market during the forecast period. Based on industry, this market has been segmented into aircraft, unmanned aerial vehicles, and spacecraft. The spacecraft segment is projected to lead the aerospace 3D printing market during the forecast period, owing to need for low volume parts that can be manufactured using 3D printing technologies. 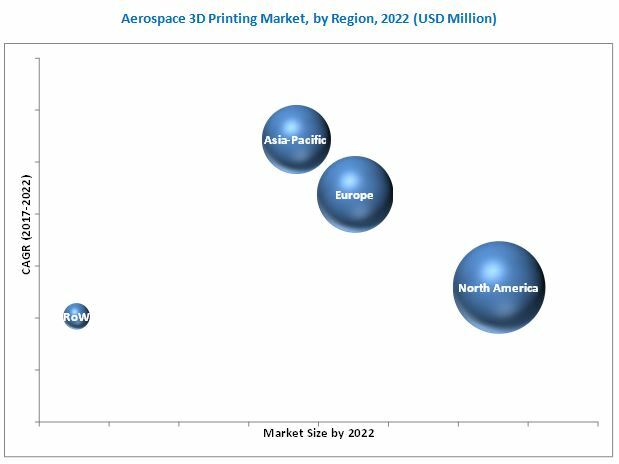 The aerospace 3D printing market has been studied for North America, Europe, Asia-Pacific, and Rest of the World (RoW). The North American region is projected to be the largest market for aerospace 3D printing in 2017. Countries, such as the U.S. and Canada of the North American region are witnessing the increasing adoption of 3D printing technologies in the aerospace industry. The aerospace 3D printing markets in the European and Asia-Pacific regions are also expected to witness significant growth, owing to increased demand for lightweight aircraft components. Stringent industry regulations and high standards with respect to the manufacturing of aircraft components act as challenges for the growth of the aerospace 3D printing market. Products offered by various companies in the aerospace 3D printing market have been listed in the report. The recent developments section of the report includes key developments by various companies between 2013 and 2017. Major companies profiled in the report include Stratasys Ltd. (U.S.), 3D Systems Corporation (U.S.), The ExOne Company (U.S.), Arcam AB (Sweden), and EOS GmbH (Germany), among others. Contracts and new product launches were the key strategies adopted by the leading players in this market. These strategies have enabled companies to enhance their market shares in the aerospace 3D printing market. *Details on Business Overview, Products Offerings,Bussiness Strategies, Recent Developments, MnM View Might Not Be Captured in Case of Unlisted Companies.